Japanese Shiho Tokuda is a superb, fast and elegant dancer with a unique “old school flamenco” technique refined in every detail by her physical strength and her emotional commitment. The outcome is a breathtaking intense experience that leaves no spectator unaffected. In order to embody her skills and widen her views and experiences Shiho Tokuda started her activities in Europe last year. From there she is today working with workshops and flamenco classes, as well as shows in various European countries and Central American countries like Cuba. I was born 1982 in Kagoshima, Japan. The year 2005 I started dancing flamenco at the Osawa Flamenco Institute. From 2007 to 2012 I joined classes at Estudio Lunares, Kumiko Yoshida and of many Spanish artists as Rafaela Carasco, Concha Vargas, Carmen Redisma, Farquito, Andrés Peña, Rocio Molina, Saray de los Reyes and many others in Tokyo. In August 2012 I was the award winner in the category solo dancer in the contest arranged by Asociación Nipona de Flamenco, Tokyo, Japan. In February 2013 I won the scholarship for Conservatorio Superior de Danza in Madrid at the CAF-competition in Tokyo, Japan. In April 2013 I moved to Spain to study at Escuela de Arte Flamenco Manuel Betanzos, Estudio Juana Amaya, Pastora Galvan and Familia Farruco in Sevilla. In September I started at Conservatorio Superior de Danza de Madrid. In the spring 2014 I moved to Sweden in order to focus on my international activities. I can offer workshops, classes, private and group lessons from beginner to advanced level. My aim is to give each individual student an opportunity to express her/himself in a personal way as a flamenco dancer. Learning flamenco gives each dancer the opportunity for a unique and personal expression - at the same time as it offers shared moments with other artists and with the audience. For beginners I will not only teach basic technique, but even give an introduction to the history of flamenco. I focus on helping the students to reach a point of understanding the rhythm and the essentials of flamenco with the body. In all my classes I take individually care of each student according to their level. I will advice each student personally in order to improve their own flamenco. Private lessons or closed group lessons are also available. In those groups the students will even have the possibility to choose and plan the content of the lessons according to their personal wishes. I can also offer a combination of lecture (short history of flamenco), easy lesson (hand clapping, easy steps etc.) and even short performance. If this fits into your demands and wishes please contact me. I can offer you to experience the flamenco in an educational but also playful way in nearly any place for people of all ages. Hopefully some inspiration will be given by my adding a little piece of world history that describes the ancient journey of the flamenco through the continents and by the various ethnicities on to today's beloved flamenco. 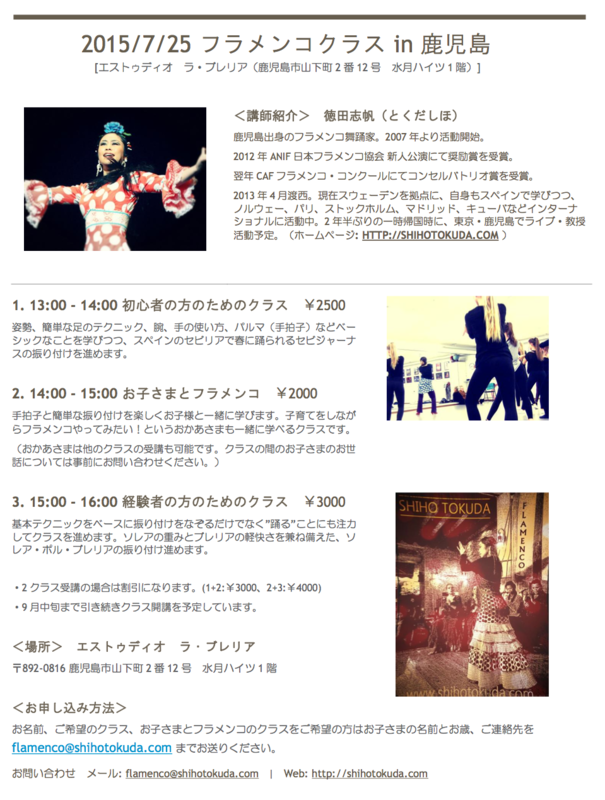 25 July: Workshop at LA BULERIA "Shiho Tokuda Flamenco workshop in Kagoshima vol.1"
2015, 23 May, 10:30 - 16:00 (My show at 12:45): Participation with exhibition stand at the "DansExpo 2015" in Karlstad, Sweden, including show on the big stage of the Expo. 2015, 11 April: Workshop at Showdansskolan Entré, Örebro, Sweden. CLASSES in Säffle, Karlstad and Kristinehamn in Sweden. 2014, 23 May 12:00 - 19:00: Participation with exhibition stand at the "DansExpo 2014" in Karlstad, Sweden, including show on the big stage of the Expo.